Having both held their own against the much fancied duo of Cameroon and Ivory Coast, Guinea and Mali meet on Wednesday evening in what will effectively be a shootout for a coveted quarter-final spot. With group D currently resembling a dead heat – remarkably every fixture has cumulated in a 1-1 draw – there is little to indicate that this won’t be another tightly knit affair, with the substantial connotations attached only adding further scope for caginess. 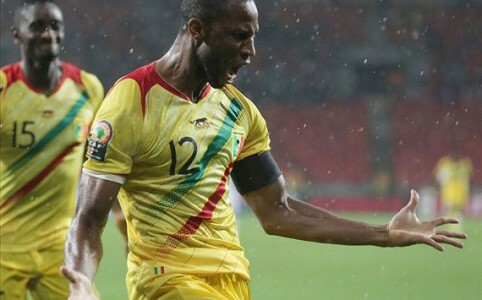 Mali – third placed finishers at the last two editions – undoubtedly have the edge in relation to experience and although pre-tournament judgements claimed the Eagles to be a side on the decline, those predictions have so far proven largely dumbfounded. There has however been one notable and potentially costly chink in the once bullet proof Malian armoury. In both fixtures to date, Mali have frustratingly failed to close out from a winning position, with Cameroon and Ivory Coast equalising in the 84th and 87th minutes respectively. For a side who have for long prided themselves on staunch defensive resilience and discipline, those exasperating setbacks – which hardly arrived in the midst of intense pressure – will be difficult to stomach. Both sides have thus far been considered underdogs in their separate fixtures; however for Mali that notion will now be thrown on its head with the Eagles thrust into a position of expectancy – how they handle that role reversal could go some way to dictating the outcome of Wednesday’s clash. In more than holding their own against the heavyweight duo of Ivory Coast and Cameroon, Guinea have already in many people’s eyes disparaged the pre-tournament doubters. Galvanised by the odds seemingly conspiring against them, Michel Dussuyer’s side are the more likely to be free of fear’s shackles. The most significant worry for the Syli National will possibly be how they and in particular goalkeeper Naby Yattara handle Mali’s intimidating aerial threat. Against Cameroon, Yattara struggled in command of his area, whilst at the same time Guinea were guilty of poor set piece marking – such a combination could spell disaster against Seydou Keita’s dead ball delivery and Mali’s imposing threat in the air. The clash in Mongomo will also mark the coming together of two of the tournament’s brightest stars to date, in the form of Ibrahima Traore and Bakary Sako. The diminutive Traore has represented the focal point to Guinea’s swift counter-attacking system, whilst Sako has finally afforded Mali the x-factor they have craved for so long. In what is likely to a tense encounter, both sides will be looking towards their talismen for a telling differential. Up to this point, Group D’s fixtures have exclusively been played in Malabo. However, it is Mali and Guinea who have drawn the short straw in being forced to relocate to Mongomo and a pitch which has received substantial criticism. The conditions are likely to prove most adverse to Guinea and their framework for breaking at pace – as Algeria and others have found the much maligned Mongomo surface has consistently proven to not be conducive to moving the ball at speed. Before the group commenced both sides probably would have taken the qualification equation still being in their hands come the concluding date. Mali may possess the greater degree nous for such high anxiety situations; however, Guinea will look to equalise that with unrivalled desire – with the threat of lots a harrowing shadow on the horizon, it would take a brave man to call this one.